3:02 We are now out of the trade window, so I'm quitting. Thanks for coming. See you next week. Take a course. 11:00 Look at the MTRainbow chart. Take your finger and trade the moves from yesterday's low, feeling the swings. Trace 7 moves. This is a simple way of looking ahead. Can you find the End Of Fractal? I have been conservative. It's not what you see on the chart, but what you put in the bank that matters. 10/17/2008 1:08:58 PM Mountain DP:: Thank Al. Good teaching today. Have a great weekend! 10/17/2008 10:52:41 AM Mountain Al:: No, I find it very dangerous to trade over a weekend, with all the government surprises. Even overnight is more risk right now than I like. 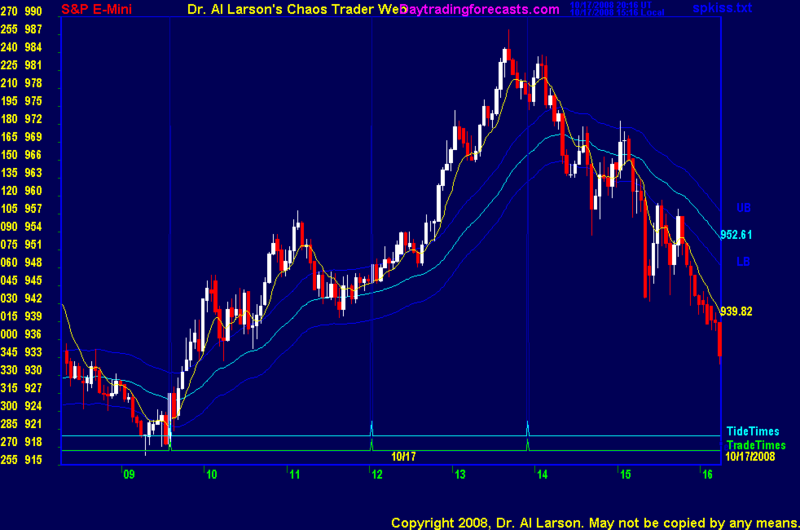 10/17/2008 10:47:20 AM Mountain mag:: Dr. Larson , since you expect a low on Monday according to the XGO, and as I interpret it there will be a big gap down on the open, do you recommend to short position on the close today? or is this to premature? 10/17/2008 10:11:30 AM Mountain AP:: Hi, would one of the regulars here please explain why there was no buy trade yesterday at 13.15, as it wasn't listed by Al. Both thje 20 and 110 EMXA both turned up. Just trying to understand. I noticed my prior comments were deleted. I hope this was by accident for some reason. 10/17/2008 8:28:25 AM Mountain DP:: Well done Al. Nice trade. I second the comment about ignoring the chart and paying attention to the bank. Cheers!